Tag Archives: bernard clark jr.
Acquired: In Person, Dallas Cowboys Training Camp 1991. Part of Jimmy Johnson‘s first recruiting class at the University of Miami, Bernard Clark was a player who showed up in big games, winning the MVP award of the 1987 Orange Bowl National Championship Game making 14 solo tackles in the game. In another shining moment, Bernard almost singlehandedly end Notre Dame’s 23 game winning streak in the Orange Bowl in 1989, pulling down an interception and making 17 tackles. He parlayed these big performances into being drafted in the 3rd round by the Cincinnati Bengals in 1990, but never started a game. 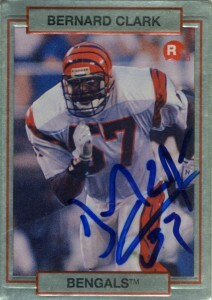 In 1991, he spent 12 games with the Bengals before being cut and playing for the Seahawks for 2 games. He subsequently was picked up by his college coach Jimmy Johnson who was trying to create competition at middle linebacker in 1992 where I’d get his autograph in training camp that year. After he was cut, he would then play for the Orlando Predators of the AFL in 1994 and 1996. After playing professional football, Bernard then pursued a career in coaching with a variety of stops at the NCAA Division I level before returning to coach in Florida and then Hampton. As of 2010, Bernard continues to climb the college coaching ranks now handling linebackers for the University of Pittsburgh and his college coach Dave Wannstedt. Clark’s nickname is “Tiger” – given to him by his parents when he was a baby because of his loud growling.